In this video we will discuss how to filter by multiple properties in AngularJS. In the example below, we are using multiple search textboxes. As you type in the "Search name" textbox, only the name property is searched and matching elements are displayed. Similarly, as you type in the "Search city" textbox, only the city property is searched and the matching elements are displayed. When the "exact match" checkbox is checked, an exact match search is performed. The following example has a single search textbox, and is used to search multiple properties - name and city. Search : <input type="text" placeholder="Search city & name"
search function not added to the textbox how it's invoking when we enter text in textbox, if it is two way databinding, searchText not used any where? //how item is related to city and name can u explain please ? 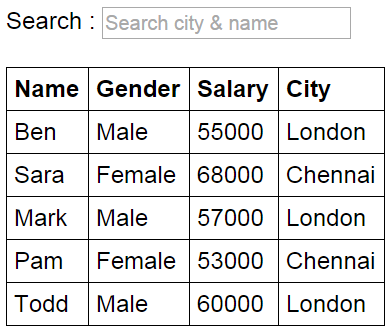 i am trying search for salary along with city and name but its not working.